Recovery in Nottingham (RiN) recently commissioned us to create a video for their Quality Account. They wanted something which they could not only show to commissioners but also something that was accessible to other professionals and service users. RiN provides support in 4 main areas: Access, Treatment, Aftercare and the Health Shop. For each of these areas we interviewed a member of staff and 1-2 service users. The staff talked about why they like working for the recovery service and what makes each service so special. The service users spoke about how the services had helped them and what they had achieved in their recovery journey. Rather than just end up with a series of talking heads we decided early on to film with a green screen background. This gave us more options with the style of the finished film. The client wanted a Nottingham feel to the film so we were able to film various Nottingham locations and place the interview footage in situ. One service user had work experience in a kitchen as part of his recovery. 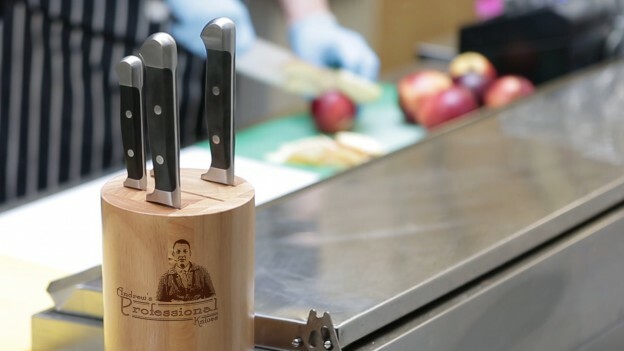 So we filmed a kitchen scene and in post production superimposed the interview onto a knife block (see image). Other interview footage appears in the Market Square, on the tram and on the Brian Clough statue. Working with the green screen interview footage in post production meant that we could put effects on the footage that helped to blend it into the scene. It also meant we could make some people more anonymous if they so wished.